William Lowther was born the son of the Reverend Sir William Lowther, Bart, of Swillington in Yorkshire. He succeeded to the baronetcy in 1777 on the death of his father and, on the death of his cousin became Viscount Lonsdale in 1802. He was elected MP, successively, for Carlisle (1780-82), Cumberland (1784-90) and Rutland (1796-1802). In 1802 he became Lord Lieutenant of both Cumberland and Westmorland, holding these posts until his death in 1844. In 1807 he was created Earl of Lonsdale (the title being revived for him) and made a Knight of the Garter. William married in 1781, Lady Augusta Fane, daughter of the 9th Earl of Westmorland and his wife died at Cottesmore Park, Rutland in 1838, where he had hunted since 1788 bringing both hounds and horses down from Westmorland. 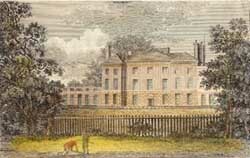 Shortly after this he leased York House, dying there in March 1844 following a six year residence. He was taken for burial to Westmorland, his coffin being followed by many residents to the parish boundary and by some all the way to his place of burial at Lowther. 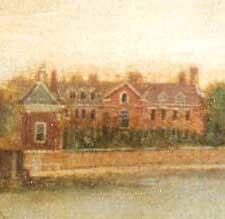 It is not known what brought him to Twickenham, although his son, Lord Lowther appears to have leased Richmond House during this period. Clearly he had made a considerable impression on the Twickenham community. He was a tolerant man, disliking strict sabbatarianism, believing that the poor should be permitted to take part in sports after the hours of Divine Service. Nor should magistrates intervene in the matter of a house “in which a fiddle should be heard”.